Almost all of my gravestones incorporate a small carving of a symbol. 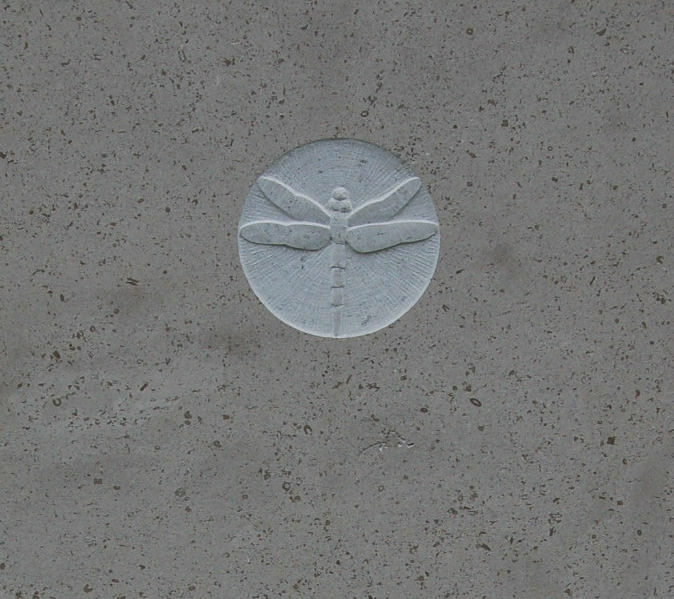 The symbol may be inspired by nature or more frequently by the person the stone commemorates. 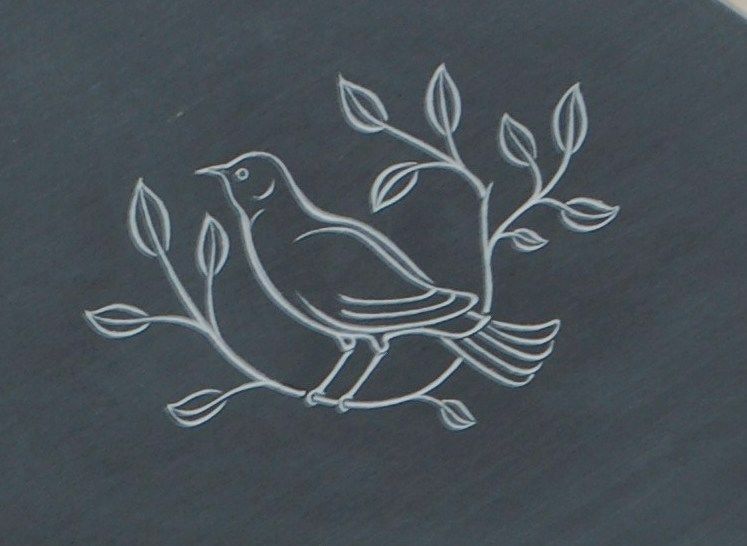 Symbols do not need to be carved in relief, they can be a simple line carving if you prefer. Here are some examples of symbols, mostly from gravestones I have carved which I hope will help inspire you. 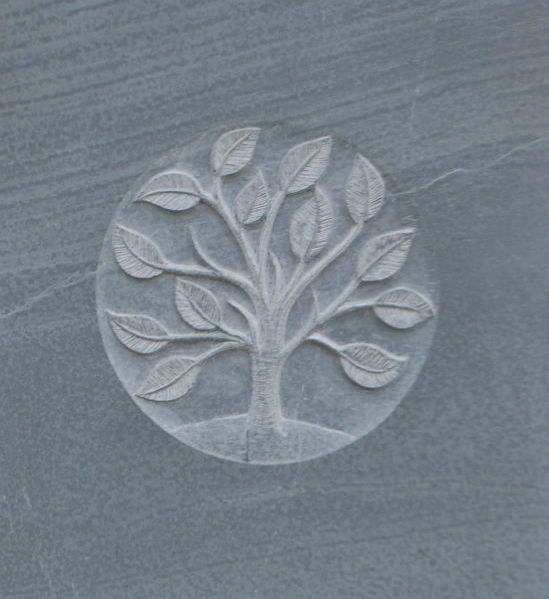 Gravestone symbols can be inspired by your loved one. 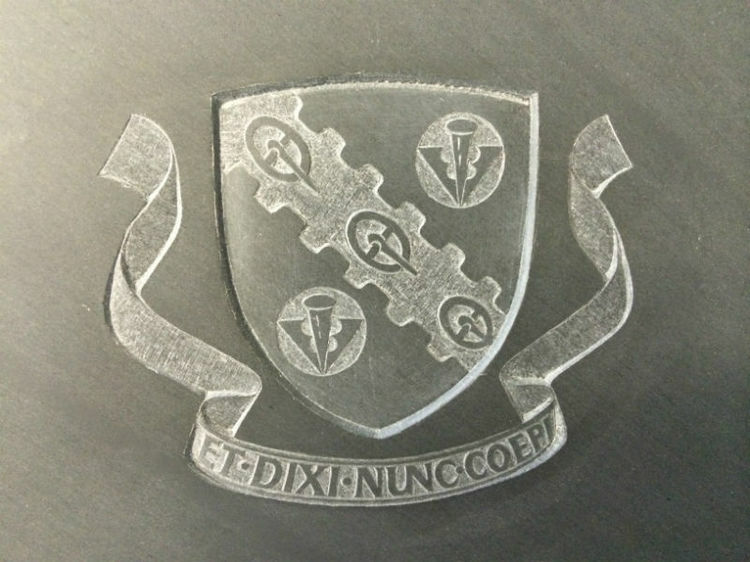 Do not be restricted to set designs or templates; almost anything that can be drawn onto paper can be carved into stone, it is just a matter of choosing a suitable stone for the symbol you choose. 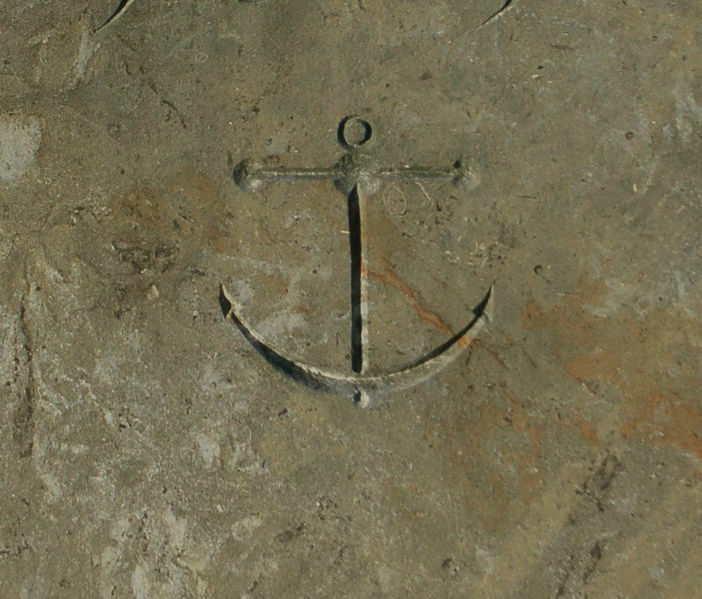 The anchor is a symbol of hope and steadfastness, and eternal life. 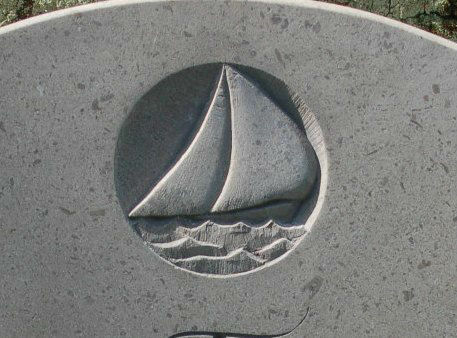 It is often found on sailors' headstones. Masons used it as a symbol of well-grounded hope. Early Christians used it as a disguised symbol of the cross. Angels are symbolic messengers between God and man. An open book usually symbolises the Bible and faith. Books may also represent knowledge or the Book of Life. 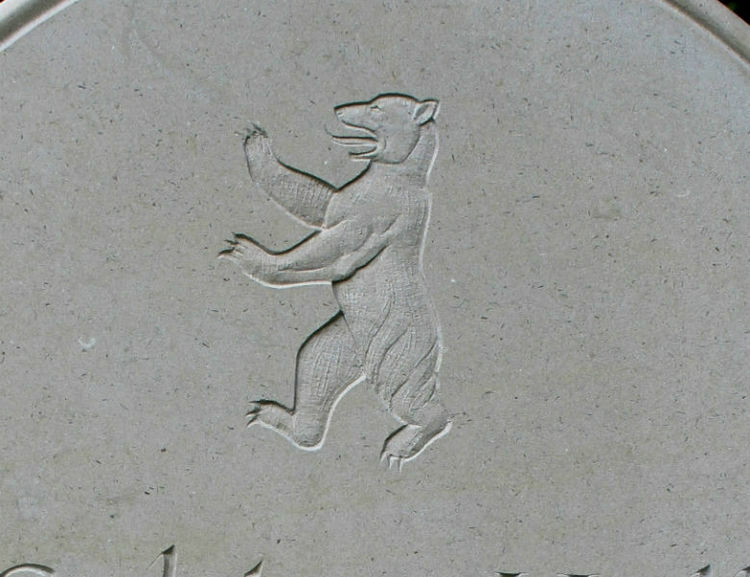 This is a carving of the "Berlin Bear" from the Coat of Arms of Berlin. The reason the city chose a bear is possibly after Albrecht I, nicknamed "the bear", who is considered to have been the conqueror and founder of the Margraviate of Brandenburg. 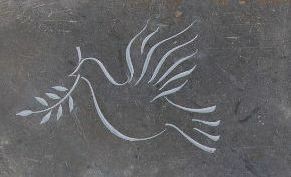 Birds are often a symbol of peace. When in flight they also may represent the winged soul, a tradition which goes back to Egyptian times. Sometimes the wings alone are chosen. A butterfly symbol may represent rebirth, resurrection, or the natural cycle between birth and death. It may represent the soul and may be found on children's headstones. 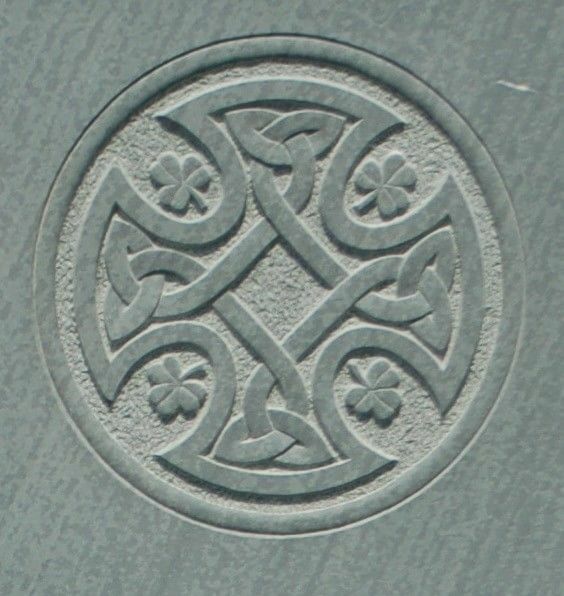 A simple Celtic cross is a symbol which combines a cross with a ring surrounding the intersection. 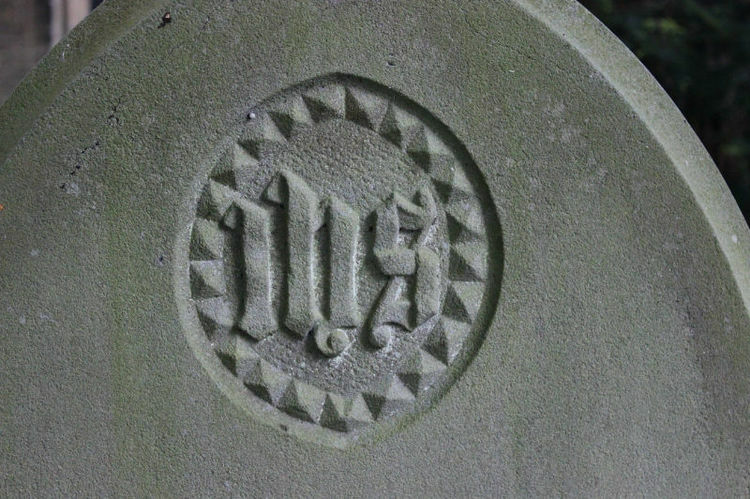 This symbol has been a popular choice on gravestones since its revival in the 1850's. The circle is an ancient symbol of eternity, often found on Christian graves together with a cross. 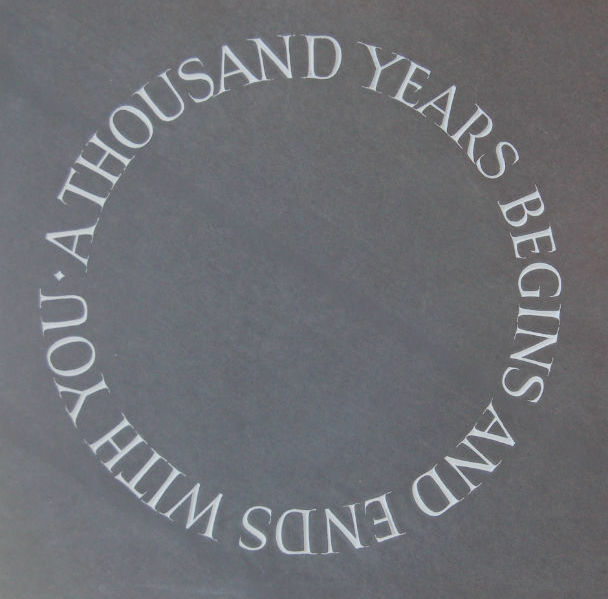 The circle has no beginning or end and may also symbolise resurrection. 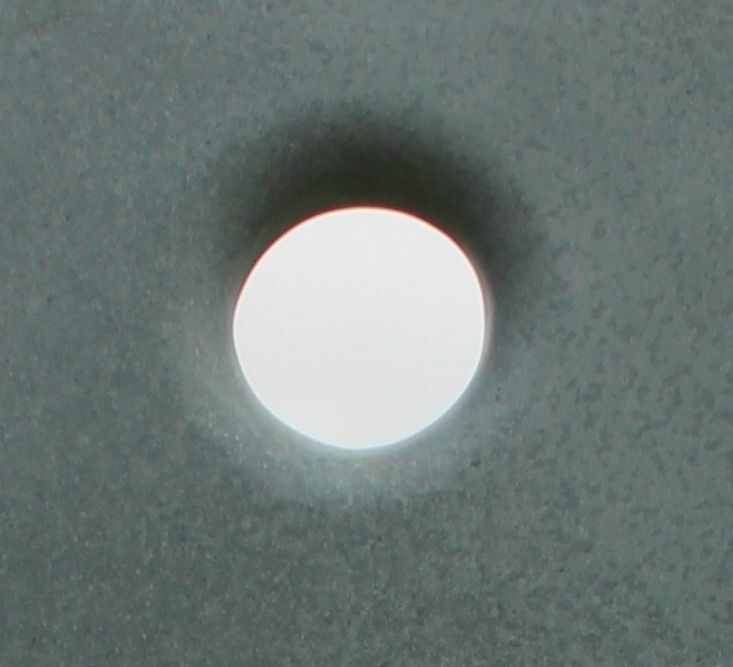 In the first image above the cirlce on the gravestone has been formed by a void, a hole carved into the stone with edges which are perfectly smooth to the touch. This invites you to approach the stone and to touch it. 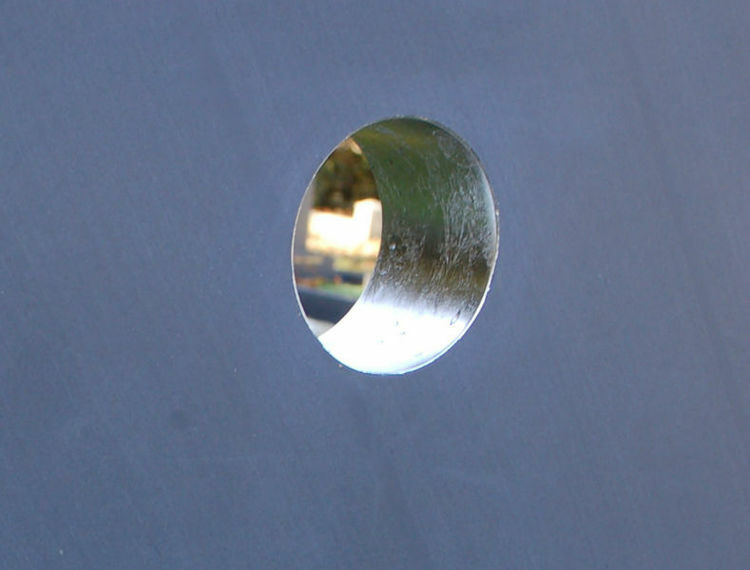 The second stone also has a hole carved into it, but this time the edges are crisp and the inside of the hole is gilded with platinum, reflecting the light. 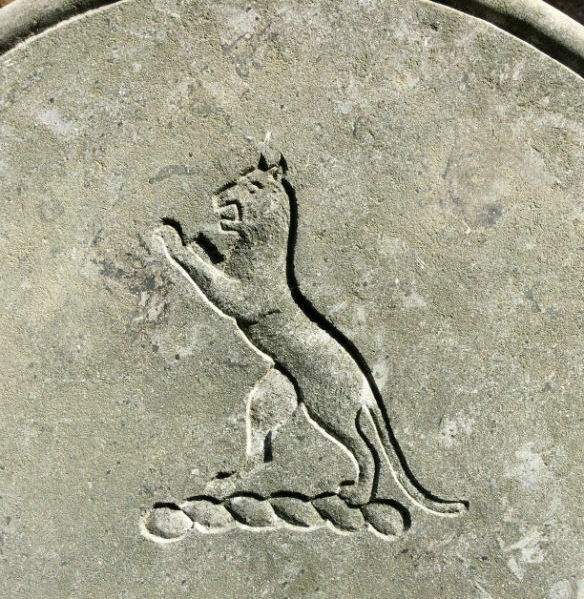 The third image is of a gilded, sunken disc carved into the gravestone. The disc could also be gilded with paladium. 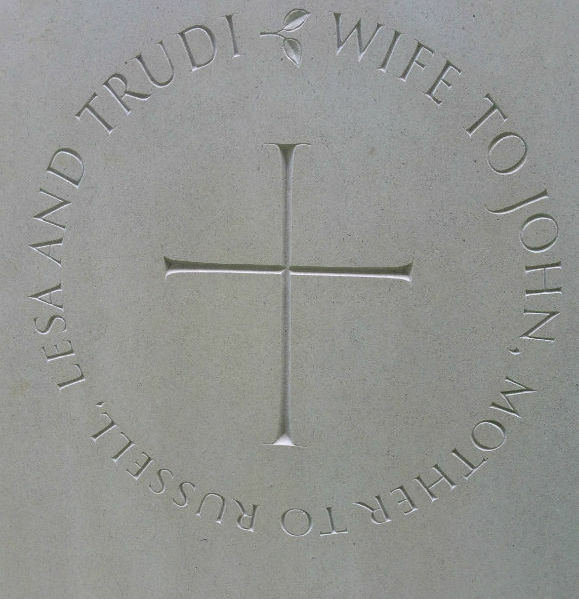 In the thid image the circle has been created on the headstone using letters, and in this case the words themselves echo closely the symbolism of the circle. 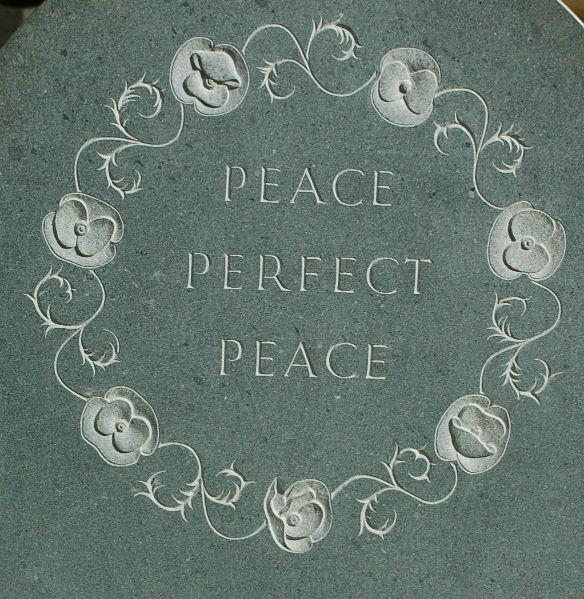 This is one of the most common headstone symbols. 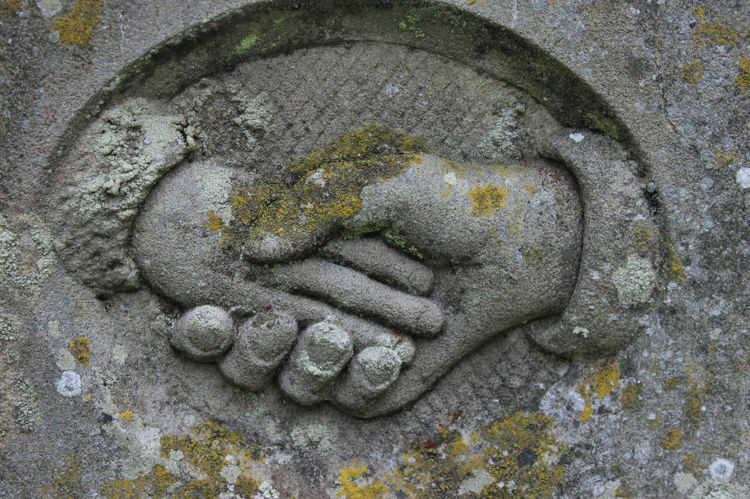 Often the hands are those of a man and woman and may represent a parting or farewell as well as unity in life and death. They may also represent a partnership or a bond between husband and wife for example. 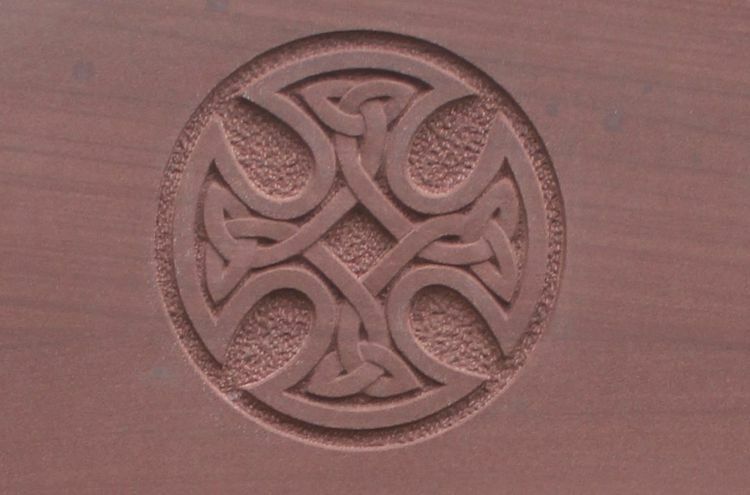 This photo was taken from an old gravestone as I have never been asked to carve this symbol. The cross is an enduring symbol of religious faith, above carved within a circle of letters. The daffodil may signify rebirth and new life. It is also a symbol of love and hope. 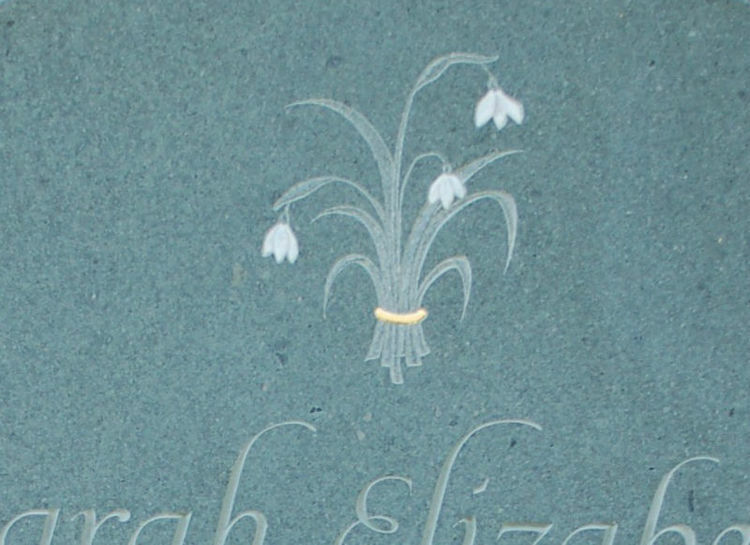 This daffodil was carved in sunken relief in Portland limestone. 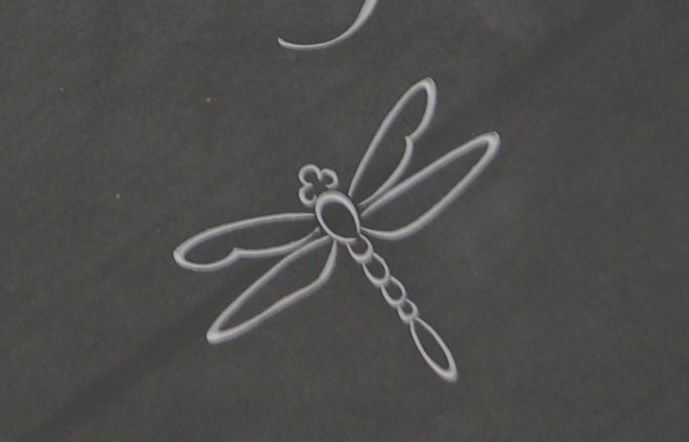 The dragonfly is a symbol of change and transformation, joy, and lightness. It can also symbolise a connection with nature's spirits. Japan made the dragonfly its national emblem. In some Native American traditions, it is also symbol of the departed souls. 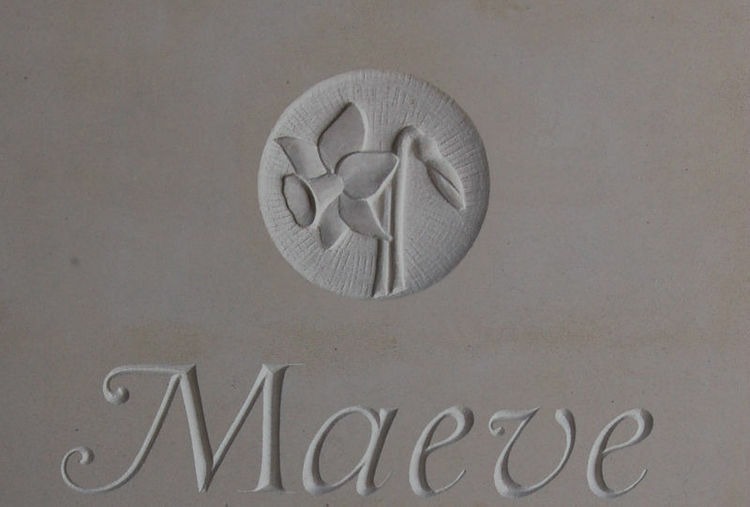 The images above show the different ways you can carve a symbol onto a headstone. 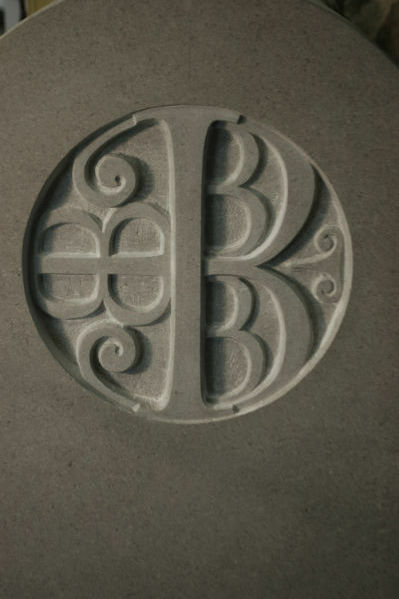 The first is carved into limestone in sunken relief, and the second is a line carving on a slate headstone. The eagle symbolises courage, strength and immortality, often regarded as a "king of the skies" and messenger of the Gods. The eagle is a Christian symbol of resurrection. 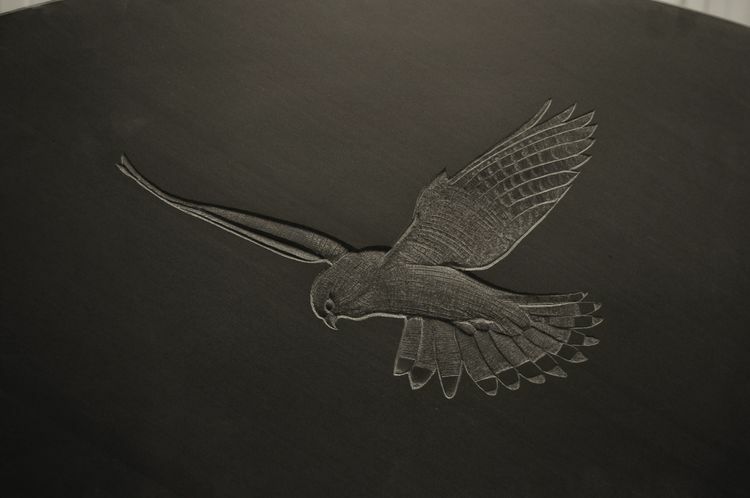 This eagle is carved in sunken relief on a slate headstone. 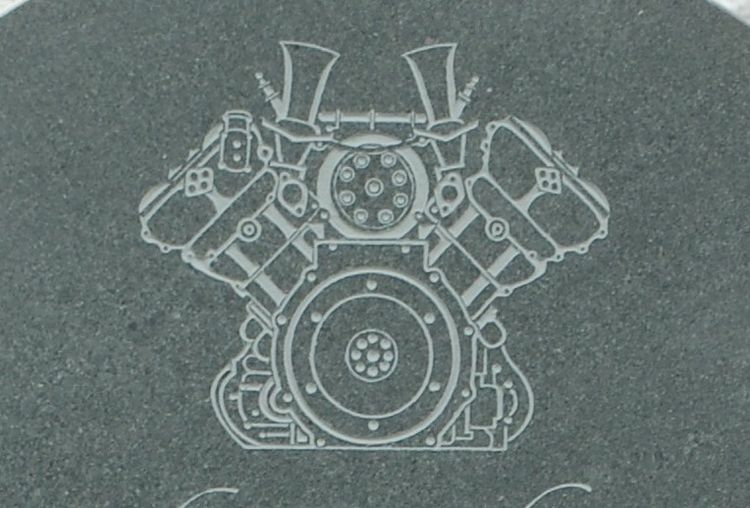 This is a carving of an engine designed by the person whom the stone commemorates. 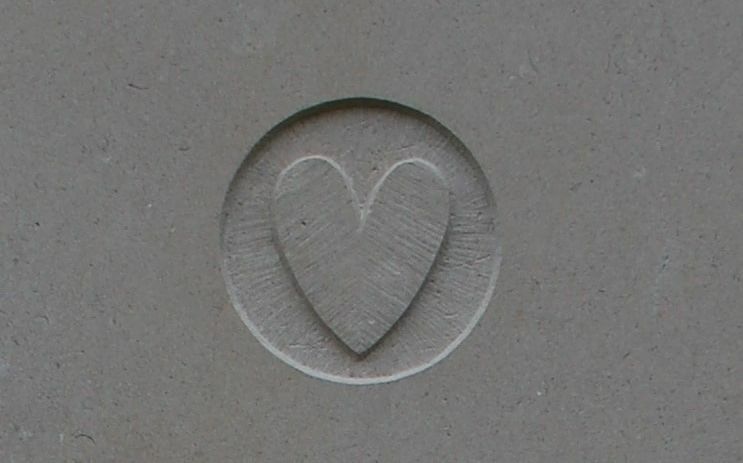 This is an example of the very personal nature of a carving or symbol on a headstone. The fox is often a symbol of cunning and intelligence. In Finnish mythology it symbolizes the victory of intelligence over both malevolence and brute strength. 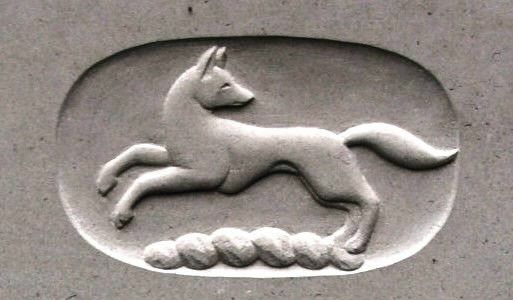 This fox was carved into a limestone headstone in sunken relief. The grapevine as a symbol can be traced back to the ancient Greeks and is still used today as a symbol of fertiilty and prosperity. The heart is a symbol of life, love or immortality. 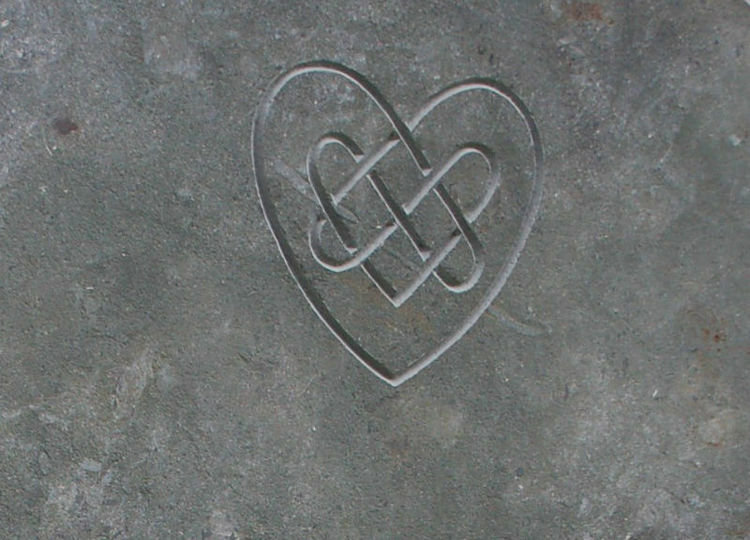 The first heart above is carved in sunken relief, and the second is a Celtic heart, carved as a line carving into Purbeck limestone. The hourglass is a symbol of death, the end of time on Earth. It may also be a symbol of rebirth and a new beginning when turned over. The winged hourglass is a symbol of man's fleeting time on Earth. Largely out of favour now this Christogram represents the first three letters in the Greek name for Jesus. 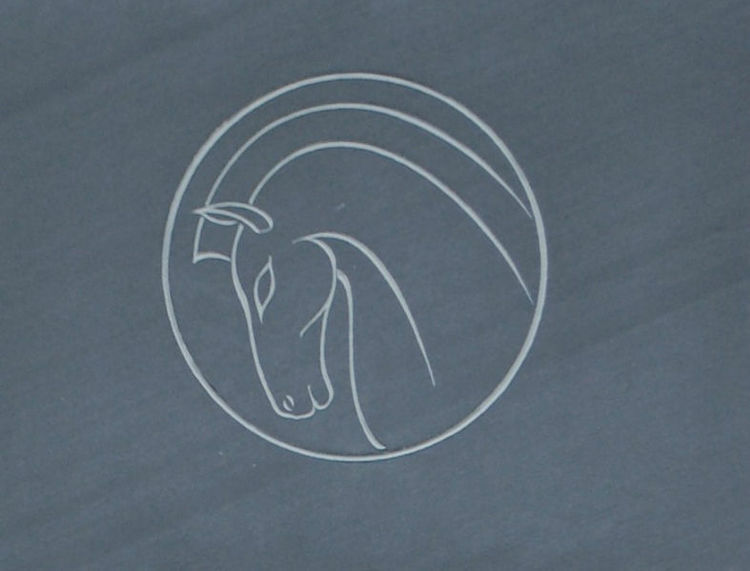 This symbol was most popular in the early twentieth century, having first appeared in the 1760's. 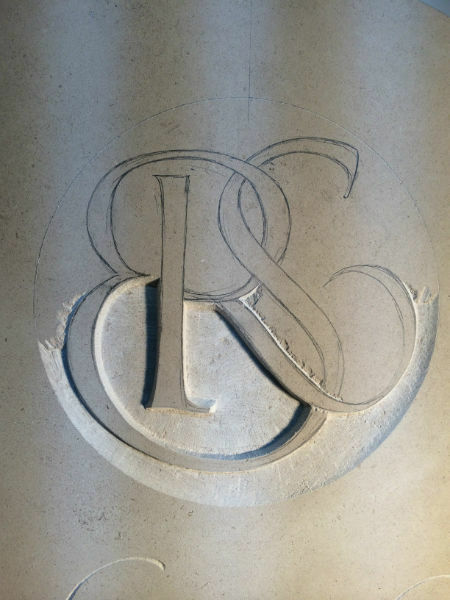 Letters themselves may be designed to form a motif which can then be carved in relief or as a line carving. The letters may be very personal. Above are two examples, the second one in progress. The lily is a symbol of purity,chastity and innocence. It was a popular funeral flower in Victorian times, symbolising the returning of the soul to innocence at the time of death. 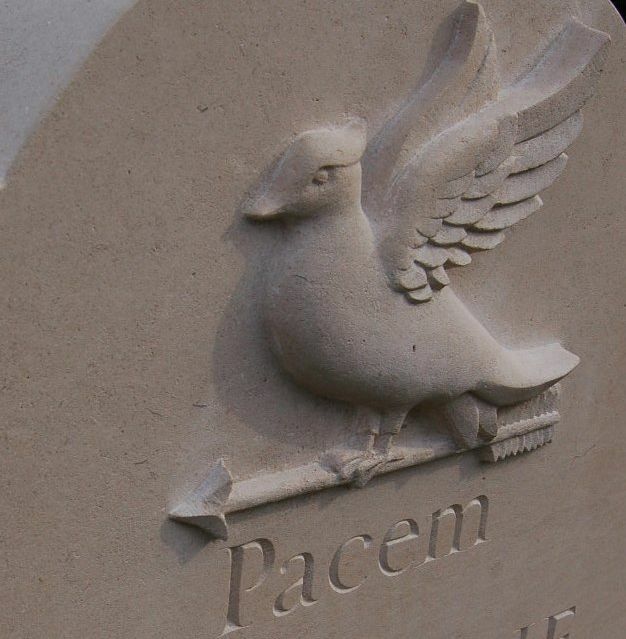 Sometimes a few bars from a special piece of music can be carved into the headstone. 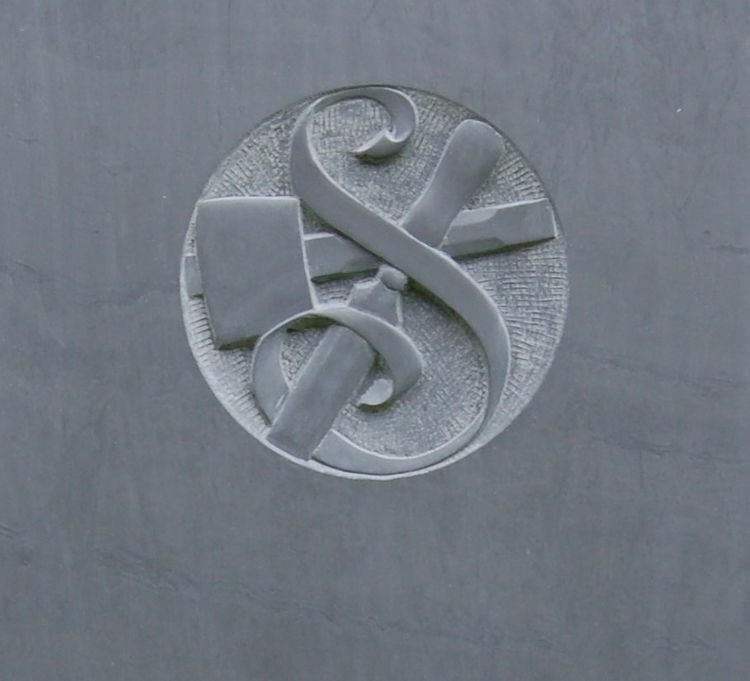 This is the back of a slate headstone, and there is also a small gilded star beneath the music. The mighty oak is a symbol of strength, honour, steadfastness and immortality. 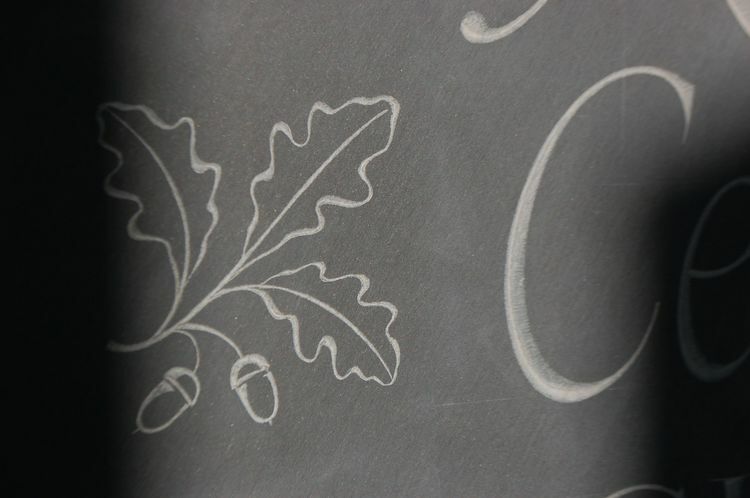 Furthermore, the acorn is a symbol of life, fertility and immortality. 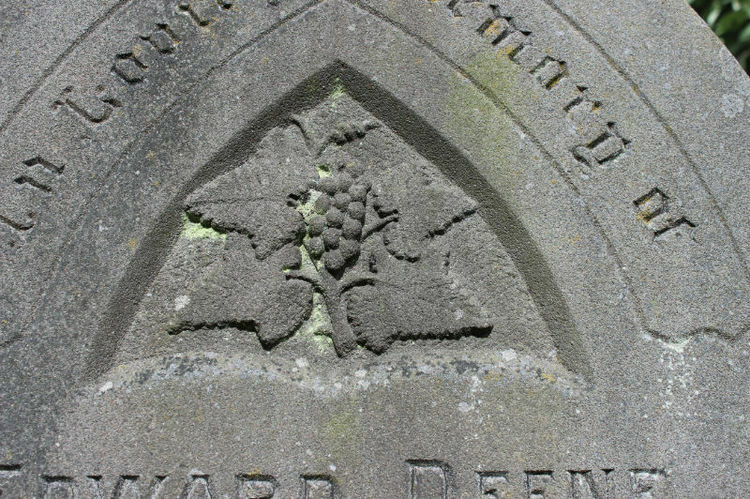 Above are two examples of headstones with oak leaves; the first is carved in relief and and the second is a line carving. In Western culture, the owl is a symbol of wisdom, which dates back to Ancient Greece where the owl was the symbol of the goddess of wisdom, Athena. 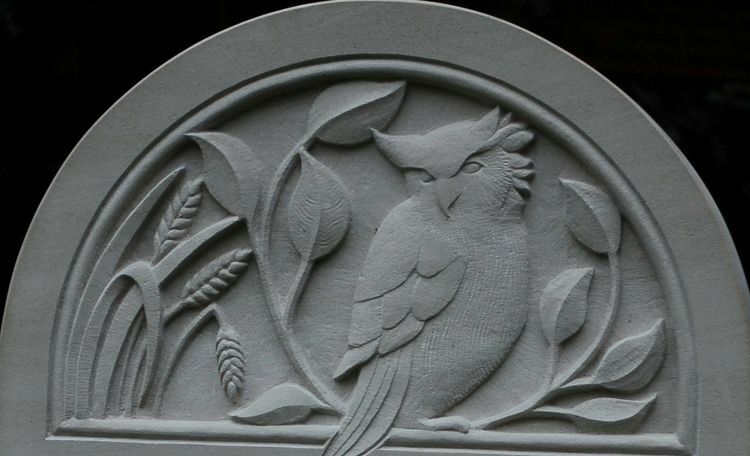 The owls on the headstone carvings above were both carved into limestone in sunken relief. The palm branch is a symbol of victory, triumph, peace and eternal life originating in the ancient Near East and Mediterranean world. The palm tree is also often a symbol of tropical paradise. 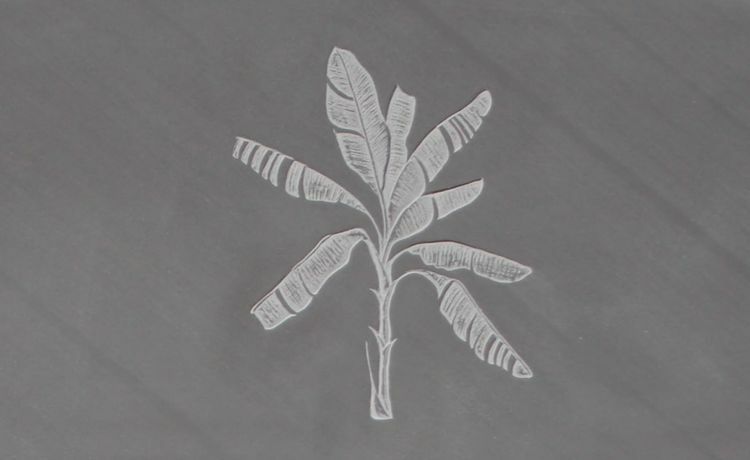 This palm tree carving is in fact a banana palm. The poppy flower is a symbol of death, eternal sleep as well as peace. 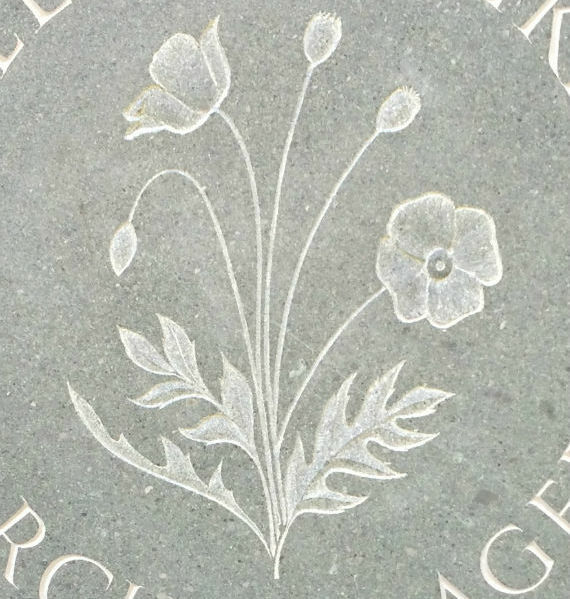 The first headstone has a single poppy carved in relief, and the second has a whole chain. The snowdrop is a symbol of hope. 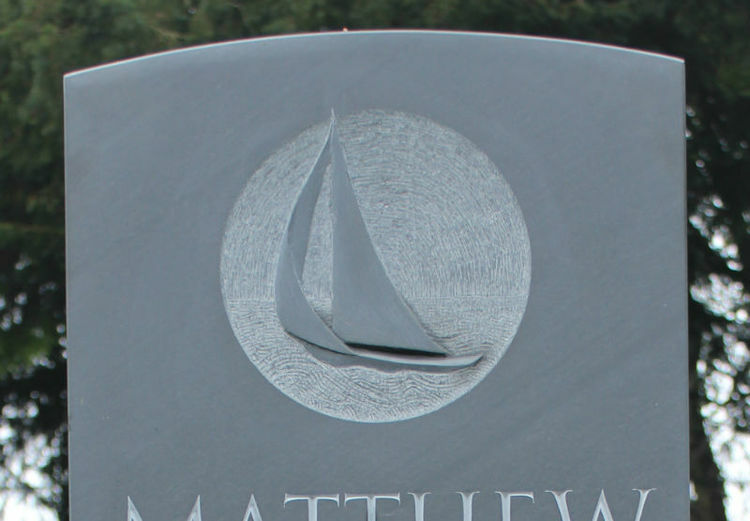 The above headstone carving in slate is very delicate and has been painted with a light wash of white and gold. A star may symbolise eternity or immortality and divine guidance. 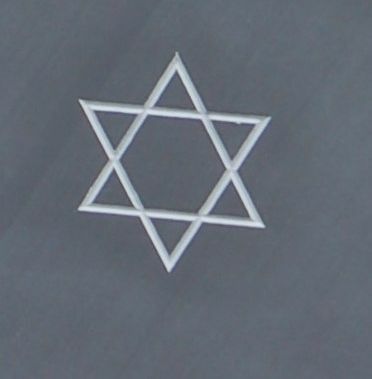 A six sided star or hexagram may symbolise creation, and is found commonly in Hinduism and Eastern religions. The two intersecting triangles may represent the delicate balance between man and God. For early Christians, the five pointed star, or pentagram represented the five wounds of Christ. Stars also symbolise hope, dreams and life everlasting. 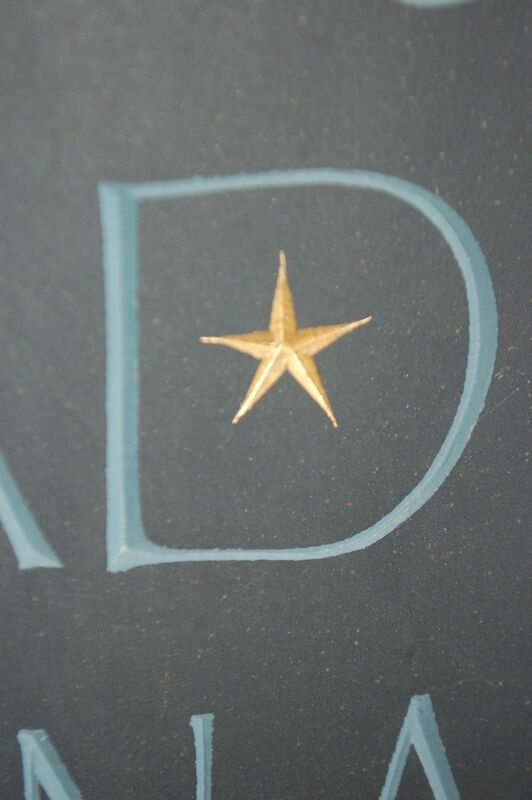 Above is a gilded star carved within a letter. 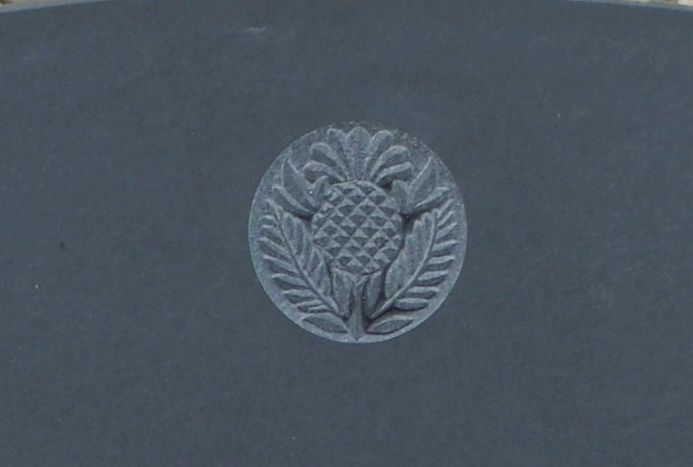 A thistle may symbolise that the person was of Scottish descent. 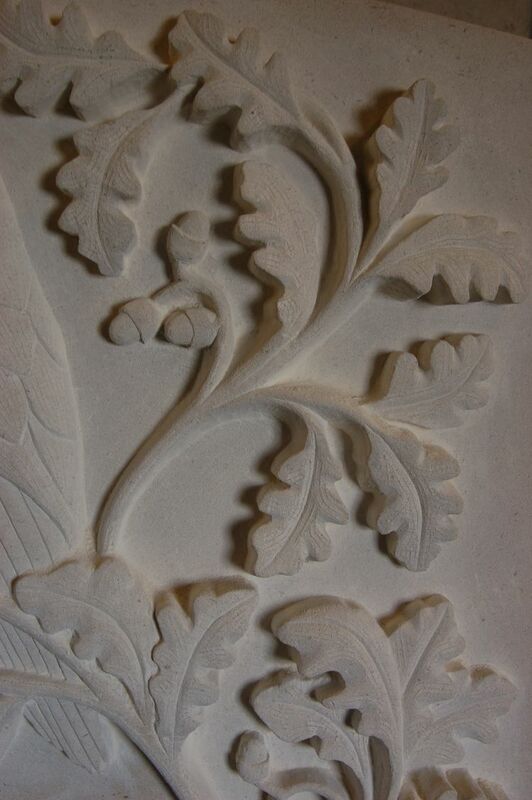 This thistle was carved in sunken relief into a slate headstone. Most occupations can be symbolised by the tools of the trade. 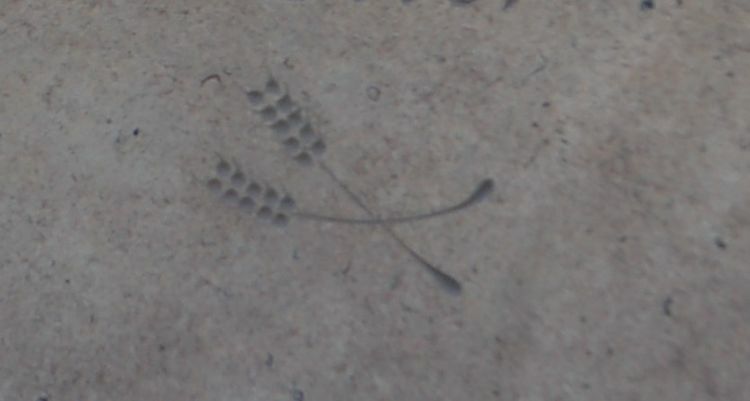 In this carving there is chisel, mallet and a strip of wood indicating the person it commemorates was a wood carver. Trees are an enduring symbol of eternal life and protection, with their roots firmly in the ground and their canopy offering protection. The Tudor rose (sometimes called the Union rose) is the traditional floral heraldic emblem of England. 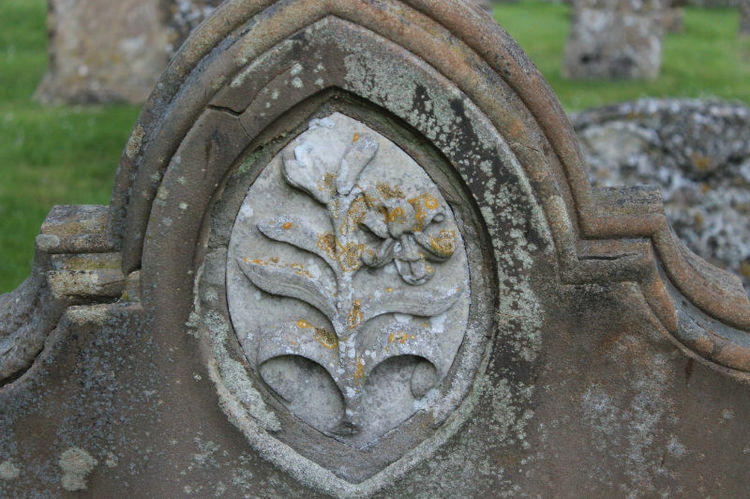 A Tudor rose on a headstone may indicate that the person it commemorates was of English descent. 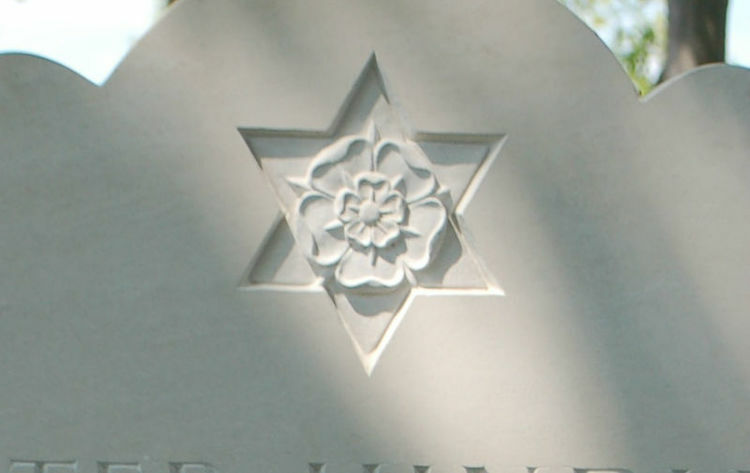 The Tudor rose on the headstone above is carved within a six pointed star. 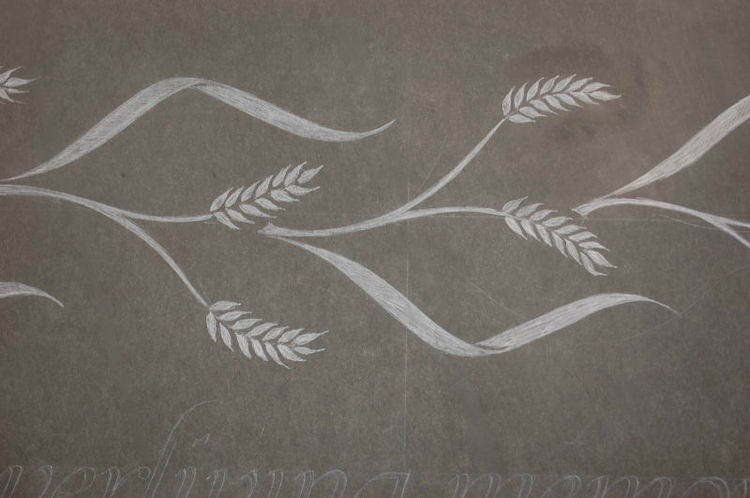 Wheat symbolises the resurrection, the cycle of the seasons and the cycle of life. Although symbols have been a feature of gravestones since the middle ages, the earliest gravestones you are likely to find in British churchyards probably date from the mid 17th century. This is because the most graves in the middle ages had little more than a simple wooden cross as a marker, with the exception of those belonging to clergy and noblemen who might have had a stone slab with the symbol of the cross at the top. During the Reformation most of these early stones were destroyed by iconoclasts , especially those with the Catholic symbol of the cross. 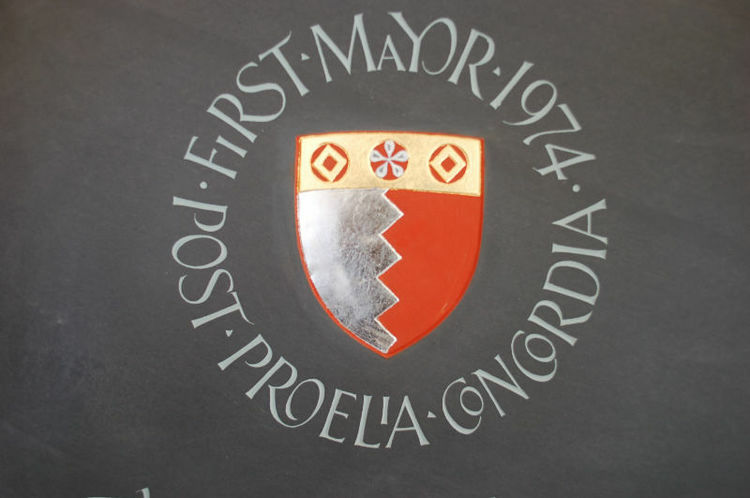 Following the restoration of the monarchy in 1660 simple memorials began to appear in churches, generally to mark graves of wealthy merchants, traders and farmers, as during this time nobility tended to be interred inside the church. During this period there was an obsession with death and mortality, and symbols tended to represent death, resurrection and the passage of time. More common symbols include the skull and crossbones, hourglass (reminders of how short this mortal life was) angels' heads, winged cherubs (representing the belief the soul would rise and live on in heaven) and tools used to dig graves. During the 18th century tools of trade were popular, and by the end of the 18th century, the morbid themes of death and time began to be replaced by more classical imagery. Mourning female figures, full length angels with urns and weeping trees were popular as were doves and whole biblical scenes. Hope and her anchor, later simplified to just an anchor was a popular symbol of hope. The mid 19th century marked the return of the cross as a symbol, and it became very popular with the Victorians, either in plain, decorated or Celtic forms. By the late 19th century, more compact symbols of a cross, foliage or a flower became popular, especially those which had Christian associations including palms, lilies and passion flowers. During this period masons would often copy decorations from pattern books, architecture, furniture or take ideas from nature. Clasped hands, tress, plants and tools were common. 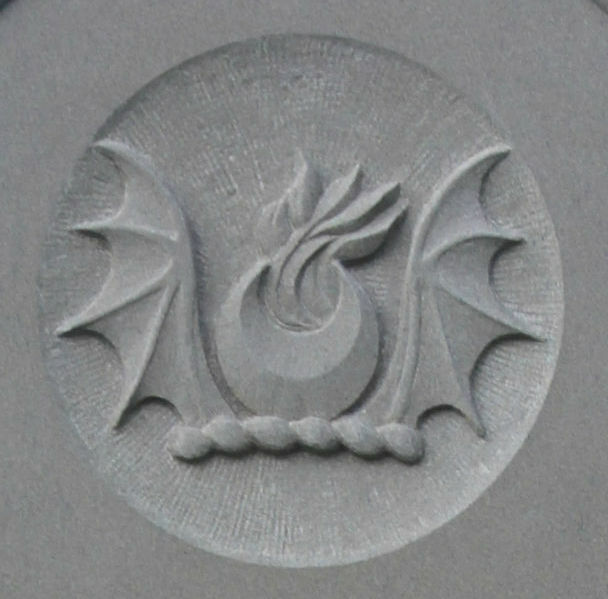 Although earlier symbols were carved for symbolic meaning rather than decoration, during the Victorian period symbols were often chosen because they were fashionable or looked pleasing to the eye, rather than for their underlying meaning. 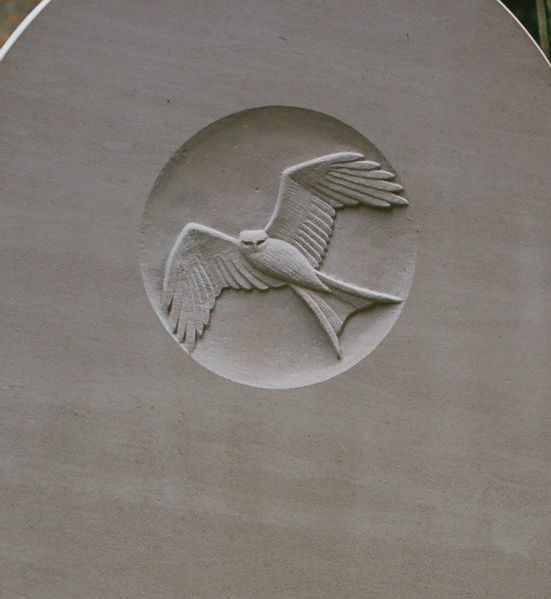 Symbols remain an important feature of modern gravestones, and while some of the older symbols have fallen out of favour, many classical symbols such as the cross and the dove remain popular. 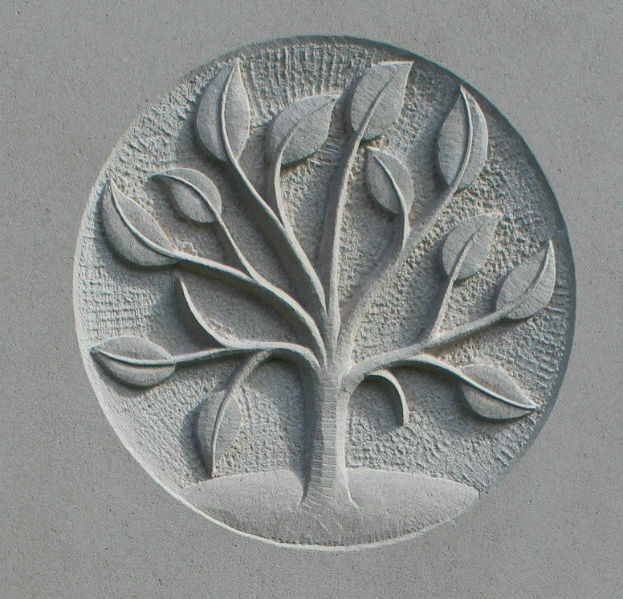 Clients often ask me to carve a symbol which is very personal to the person being remembered; whether it be their favourite plant, or a copy of a piece of artwork they produced, the symbol is chosen because it meant something to the person. 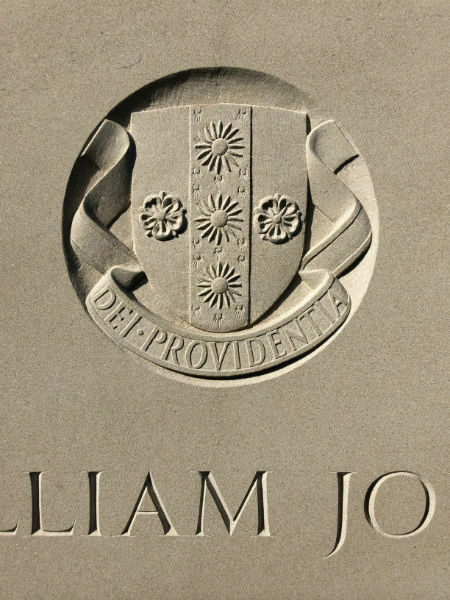 Headstone symbols will no doubt remain popular for years to come, and although fashions change slightly over time, they continue to give us an insight into our humanity.